TOME: Immortal Arena introduces highly streamlined 3v3 browser-based MOBA gameplay. PAX 2014: Shawn Carnes, avid poker player and front man for Kixeye’s TOME: Immortal Arena, is nothing if not dedicated. “I haven’t gotten to play a game of poker in more than 10 months—that’s how invested I am in TOME, And you can quote me on that!” he says with a broad smile. So I did. And then we talked a little “MOBA gameplay philosophy”, and then I played his game. 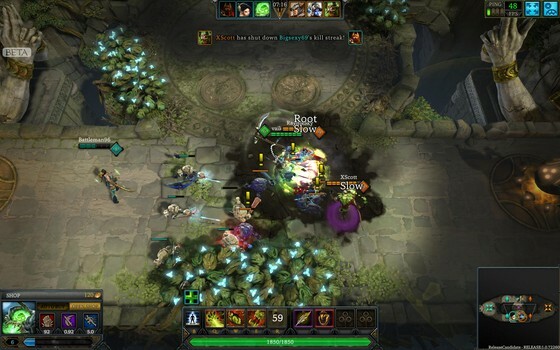 “Philosophically, I think we’re entering basically the 3rd generation of MOBA games. The first generation was DOTA, the second was League of Legends, DOTA2, and many similar games, and the third generation of games is just starting,” Carnes explains. Many MOBA games (League of Legends, DOTA2, Heroes of Newerth for example) use similar controls and mechanics. And every game has dozens of unique characters, further complicated by items, progression trees, and metagames that must be mastered to become even vaguely proficient—and perhaps more importantly, crest the wall of toxicity and exclusion for which MOBA gaming communities are infamous. The first change is that TOME focuses on 3v3 matches in relatively small 2-lane maps which is so small that you will virtually always be in or near the thick of any fight. Each lane has a single tower and ends at an altar—destroy the altar and you win. There is no jungle either—only a single, centrally located neutral monster that buffs your minions when you kill it. The small map and reduced number of objectives results in drastically shorter matches. A few post-PAX games I played were 20 minutes or less. My own lack of experience with the game probably contributed, but the games tend to be short, fast, and frenetic. In addition to the streamlined maps, Kixeye has implemented a number of other ‘timesavers’ to speed up play. For example, you can buy items at any time, and heal by simply escaping combat and finding a safe place to rest for a brief period. Character abilities automatically level up, and respawn times are short, and seemed to max out at about 20 seconds in the late game. Characters—called Guardians—are generally divided into 4 familiar classes: Tank, Slayer, Pusher (Mage-types), and Tactician (support-types). Each Guardian is also aligned to 1 of 6 domains: Fire, Earth, Air, Water, Creation, or Death. Playing Guardians aligned to a domain gains favor with that domain, which in turn opens up Blessings—active powers or spells that can be applied to Guardians. In addition, every Guardian has a specific progression tree that unlocks Relics specific to that character. Relics provide an array of buffs to the Guardian. Like virtually all F2P (free-to-play) MOBA games, there are 2 currencies—one earned by playing (Favor), and one you can buy with real-world money (Platinum). Both are used to unlock characters, skins, etc. In keeping with the goal of improving accessibility, TOME provides a decent tutorial experience for new players as soon as you start a game—and playing the game is as easy as visiting the Web site and clicking “Play”. Yes, TOME: Immortal Arena is a browser-based game. You’d never guess it by looking at it or playing it. Shawn Carnes guided me through a game of TOME at PAX 2014, and I followed up later with a few games on my own. Fundamentally, TOME plays similar to other RTS (real-time-strategy) based MOBAs. Movement is handled through right-clicking, and abilities triggered through the Q-W-E-R keys. Not surprisingly, because TOME all but dispenses with the idea of returning to base, there is no Mana in the game. All abilities are governed by cooldown periods. Items in the game—at least at this point—are very streamlined as well. Prices are largely uniform and divided amongst 3 simple categories, although there are still plenty of options available—and likely more on the way. Towers also have limited ammunition that recharges slowly. However, while this mechanic may be “different” from other MOBAs, it doesn’t fundamentally change the necessary tactic of swarming a tower with minions before wading in with your Guardian(s). TOME: Immortal Arena is still in beta, so many things may change of course. The list of Guardians will grow, as will the maps and other elements. Here’s another little bonus too: Bruce Campbell (i.e. Army of Darkness pop-culture B-movie legend Bruce Campbell) does the ‘announcer’ voice work for the game. And remember, you don’t even need to download anything because it’s all browser based. You can try it almost as soon as you visit the site (even without creating an account). Next Post: Deathtrap spells doom for clowns and pirates. And Pirate Clowns.